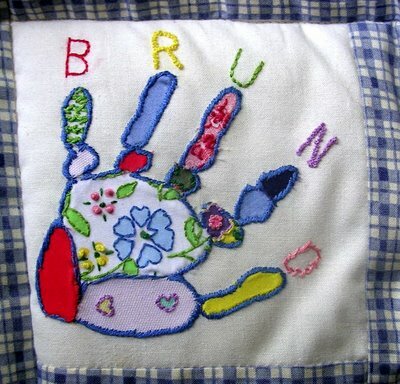 We have a family tradition of welcoming new babies with a quilt made out of handworked patches. My niece Rosie made this patch for my son Bruno's quilt by having her son Charlie leave a handprint on the fabric that she overlayed with appliqued pieces of her old dresses and embellished with embroidery stitches. This item is the first in a series I'll call Gifted Wednesdays that features the handwork of friends and family.